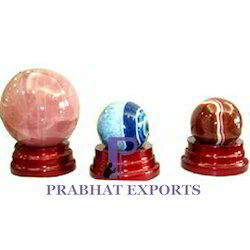 Our offered Stone Balls are precisely fabricated from optimum quality semi precious stone and cut edged technology. This elegantly designed and intricately crafted range is highly in accordance with the latest fashion trends of the market. Customers can avail this range in desired sizes, colours and specifications at market leading prices from us. Further, we also offer customised solutions for packaging to our clients.